If you have decided to restore your smile with dental implants, it's important to understand what to expect during dental implant recovery. You are probably wondering: How much downtime will I need? What can I eat? What can I do at home to make certain that I heal properly? Dr. Robert F. Berger in Columbia, SC, explains everything you need to know in order to have a successful recovery. You will need to keep gentle pressure on the surgical site by biting down on a piece of gauze. After an hour, you can begin changing the gauze every 30 to 45 minutes. This can usually stop after the first day of recovery. Dr. Berger will prescribe pain medications for you to take at home. You can also apply an ice pack to the outside of your jaw to further control any discomfort. In general, dental implant patients can expect to be able to return to non-strenuous work after two to three days. You can expect to experience some post-treatment swelling and bleeding for five to seven days after your procedure. You may also experience dry mouth, sore throat, and stiff jaw muscles. Until the incisions have healed, you should limit your diet to soft, cool foods such as yogurt, pasta, eggs, and soup. Try and avoid having your food contact the treatment site. As the days go by, the discomfort, sensitivity, and swelling will subside. Contact the office right away if you experience side effects such as a fever, which could indicate an infection. In general, dental implant patients can expect to be able to return to non-strenuous work after two to three days. As you heal, it is as important as ever to maintain your oral hygiene, but you must take special care near the surgical site. Brush slowly and carefully near the incisions. Twenty-four hours after your surgery, you should begin rinsing your mouth with a saltwater solution after every meal. Just mix a tablespoon of salt with 8 ounces of warm water. Gently swish it inside your mouth, then let the water fall into the sink - do not forcefully spit. How Long Does Dental Implant Placement Recovery Take? 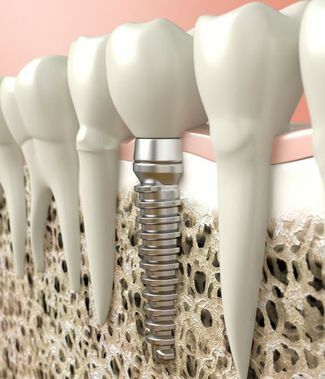 Complete recovery from dental implant surgery takes several months as the implant posts fuse with the bone tissue in a process called osseointegration. You will undergo regular checkups with your doctor in order to monitor your progress. Within three to six months, you should be ready for placement of your abutment piece, which will connect your restoration to your implant. The gums will need a couple of weeks to heal before you can receive your permanent restoration. As a fellow of the International Congress of Implantology who has decades of experience placing and restoring dental implants, Dr. Berger is uniquely qualified to coordinate and perform every stage of your treatment. You can depend on him to provide the guidance you need in order to experience the very best benefits of dental implants. Contact the Berger Dental Group to set up your next appointment by messaging either of their offices online or calling (803) 787-9793.